Leah Renaud and Kari Welniak working in the field. Photo by Scott Prewitt. It was the first day of summer class and I had no idea who anyone was. Some people looked familiar from walking around on campus, but I never knew what anyone’s story was. There was one striking feature about that first day though that I won’t forget. Energy balls. They looked like little balls of oatmeal, granola, almond butter, white chocolate chips, and coconut all wrapped up in the shape of eggs in foil that came in a large bag. At first I was hesitant, but then after having enough energy to last me through the first day of video boot camp, I can never go back. Who gave me these weird concoctions you might ask? Leah Renaud. Leah’s journey to becoming a journalist is not like any others. She first came to Creighton as a Biology/Pre-Veterinarian major. She chose Creighton in particular because she fell in love with the Jesuit education and way of life. Little did she know what where she would be today was a result form a series of surprises. After realizing blood and guts were not her thing, she tried Psychology. When that didn’t work out, she explored other opportunities. She knew she had always had a passion for graphic design and photojournalism. So one day she decided she would pursue her dreams. And now she could never be anymore excited to use her skills that she truly enjoys having and puts these to work. When asked what was one of her happiest moments here at Creighton, she replied with the day she got her Delta Delta Delta bid card. Tri-Delta is one of the sororities here on Creighton’s campus. After meeting with Leah, I found it very inspiring to see someone who really loves the organization that she is proud to be a sister of. She works hard as the Vice President of Public Relations within Tri-Delta and is a national rep for Tri-Delta’s BodyImage3D. BodyImage3D® was launched by Tri-Delta as a multi-dimensional approach to body image awareness and education. The goal of the program is to promote an in depth body image as the central focal point for three key components: healthy mind, healthy body and healthy spirit. Leah expressed how thankful she was for the opportunities Tri-Delta has brought her. 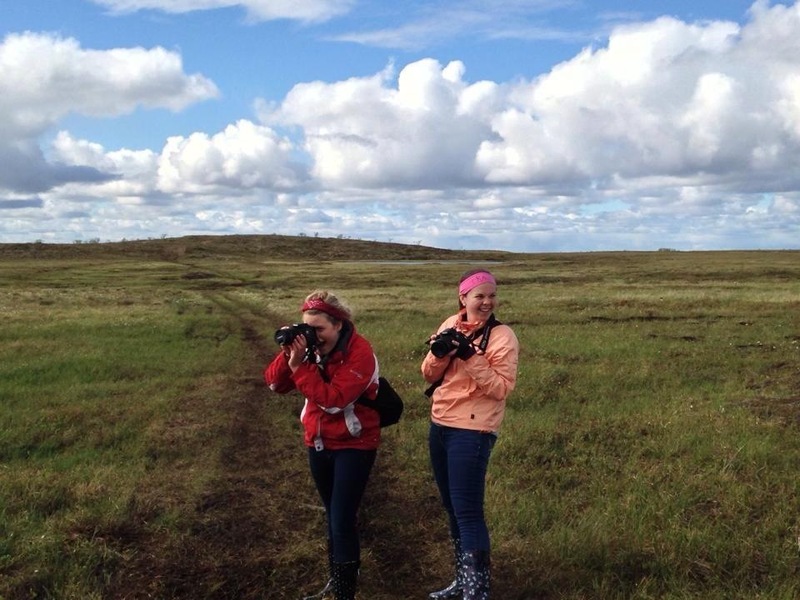 Leah has been on service trips before, but her trip to Alaska was definitely one for the books. Leah first heard of the trip when she was doing her duties as a Resident Advisor in McGloin and started hanging up posters on the bulletin board. Then she came across a poster, “Want to travel to Alaska?” She quietly snuck the poster away and kept it until the day she moved out of her room. Why did she want to travel to Alaska? Leah thought it would be an amazing experience to see what its like to live in a place where a different culture is still fairly predominant. And that it did prove to be one for the books. Especially after our interview with Nelson, its hard to swallow what climate change has brought to people who live thousands of miles away from us. The reality of climate change really came to life after hiking to Exit Glacier on one of our last days in Seward, Alaska. That one moment, standing on the edge of Exit Glacier made Leah realize the harsh truth of the matter; if people don’t see the importance of things such as culture and climate change, they are just going to keep disappearing. After meeting with Leah Renaud you realize she is driven by a desire to learn and gain new insight, is constantly working on her design, writing, and public relations abilities, but also manages to stay a proud BlueJay fan, a constant human juke-box singing show tunes from many different musicals, Internet explorer, lover of puns, superhero nerd, a Dreamer and Doer. Now after meeting with Leah, one might ask, “How does one person do all the things Leah is able to accomplish and be so passionate about so many things?”. The truth is in the energy balls.